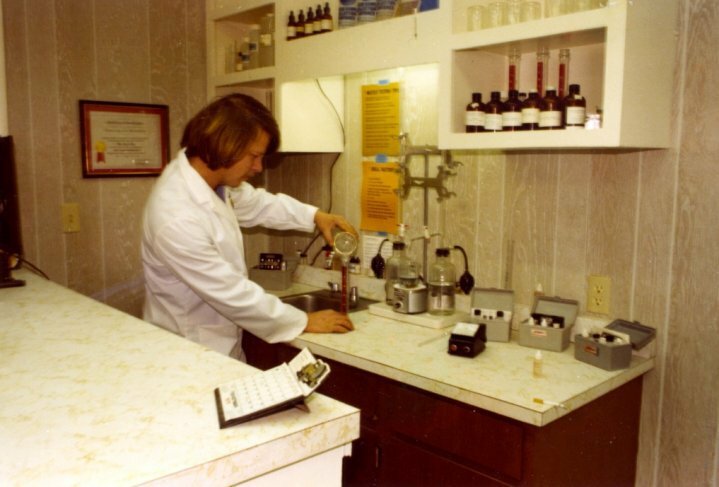 My dad in his chemistry class, learning how to manage the PH levels of swimming pools. While the treasure hunting business was being formed in the mid to late 1980s, many things were changing. My parents had been running a very successful pool company when they first went on a dive trip to Haiti. Since I wasn’t born until 1987, the only stories I have of that time are from my parents. This week I had my mom recount her version of the early years of the treasure hunting company. She has been by my dad’s side since the beginning, and hearing her side of the story in addition to the side I had already heard from my dad helped make a more complete, well-rounded tale of the forming of what would one day become Sub Sea Research. It is also interesting to hear more of what my parents did before they ran Sub Sea, and to learn how those skills were cultivated for use in the business they are in now. Aqua Pool Company, my parents’ gunite swimming pool business, was created in 1981. The company would operate between the months of April and November each year, with preparations for each season beginning in March. Every year my mom and dad would go to pool shows in the mall and other locations, looking for new customers. They would hand out brochures and show photos of the many beautiful pools they had already built. My dad had gone to chemistry school and was knowledgeable about PH levels and maintaining clean and sterile swimming pool water. My mom dealt more with customer service and keeping up good relations with new and old customers alike. In addition to building pools for people, they also helped service existing pools and spas. They had a shop on Congress Street in Portland, Maine, also called Aqua Pool Company. The store was small, but was a good place to attract new customers. My dad and his friend Ron Fawcett built a stunning stone wall on the side of the building, which still stands to this day, though the place is now a dive shop. In 1983, my dad’s brother Matt Brooks came back to Maine from where he was staying in Georgia. He also worked on swimming pools, and so he and my dad joined forces to help their growing businesses. They changed the company’s name to Pool Creations, and the home base moved from Congress Street to St. John Plaza in Portland. The new store was larger and more elaborate, with a “backyard” decor. There was a hot tub, palm trees and wall designed to look like the back of someone’s house. My mom ran the store, testing pool water and selling chemicals needed to maintain the PH levels of the water. She also did payroll for the company and the small amount of crew members my dad and Matt employed. This fateful decision is what led to the creation of what is now Sub Sea Research. In my next article, I will share my mom’s perspective of that trip to Haiti and the find of the first silver bar.